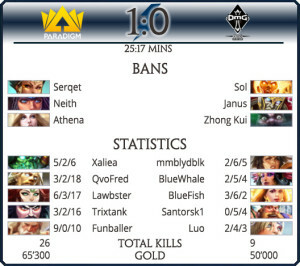 ‘OMG B’ starts out strong and it isn’t until about 4 minutes into the game, that ‘Trixtank’ gets the first kill for our boys, moving the score to 2:1 in favor of the Chinese team. “HOG” (Hand Of The Gods), which – since the nerf – has fallen out of the meta recently, seemed to be a small, yet deciding factor, when ‘PDG’ defeats a Gold Fury and trades a member for another, starting to turning the match in their favor: with approximately 15 minutes on the clock, ‘OMG B’ takes a Deicide to the knee and ‘PARADIGM’ decides to become very comfortable. What felt like “a kill every 3 seconds” (as the casters put it so nicely), soon turns into the downfall for China. Our boys go hay-wire, aggress wherever they can and around 21 minutes, we see another Deicide and the fall of ‘OMG”s Middle Phoenix. Knowing that they need to make some plays now, our Eastern competitors participate in a fight at the Fire Giant at ca. 22:30 minutes, but unfortunately ‘PARADIGM’ not only gets the powerful buff, but they also take down a few of the ‘OMG’ members, resulting to the game ending with yet another Deicide at 25 minutes and – ultimately – the game. A friendly Jump-Party in the beginning and suddenly First Blood at 18 seconds in, due the aggression from ‘PARADIGM’! This kill definitely set the pace for the rest of the game. At 3 minutes, ‘OMG B”s duo lane gets annihilated, but not without getting a revenge-kill over in solo. By 10 minutes the score was 8:3 in favor of our boys and it felt like a crazy, fast-paced ping-pong match: one kill left, one kill right, kills all around about every minute! It almost seemed like ‘PDG’ just couldn’t wait to win and progress, with how aggressive they were on executing all these tower-dives. A funny moment occurred at ca. 18 minutes, when ‘Xaliea”s Bellona just didn’t want to die. I was almost waiting for the “Benny Hill” theme to start playing. Eventually he fell to China though, making the score 8:22. Only 5 minutes later, ‘PARADIGM’ breaks the first Phoenix of the game, pushes in and proceeds to end the game. While ‘PARADIGM’ seemed to explode allover ‘Oh My God B’, we must give major props to the Chinese boys, for adjusting so well from one moment to the other by counter-picking, mimicking and just executing incredible skill. 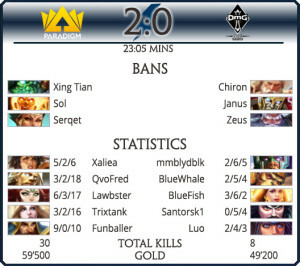 Just the day before their games were quite a bit weaker, but it appears as if they practiced and improved quite a bit overnight and they also did their homework, in terms of researching what ‘PDG”s typical picks are (‘Trix”s Bacchus got banned instantly!). In the second game we even saw the Danish Support on an Athena, a very rarely seen pick for him. In the end though, it seemed that the only real “mistake” ‘OMG B’ made, was to not have as much experience as ‘PARADIGM’. It was an extraordinary good set of games and if it had to be summarized into few words, it would probably be “Experience (‘PDG’) VS Pure Skill (‘OMG B’)”.